The solubility of this compound in DMSO is >21.5 mg/ml. General tips for obtaining a higher concentration: Please warm the tube at 37℃ for 10 minutes and/or shake it in the ultrasonic bath for a while. Stock solution can be stored below -20℃ for several months. Bicalutamide was found to be able to inhibit the growth in prostate cancer cells (VCaP cells) with overexpressed androgen receptor through directly binding to AR then mediating androgen-mediated gene transcription. Moreover, bicalutamide could impair the DNA binding and nuclear localization in prostate cancer cells. 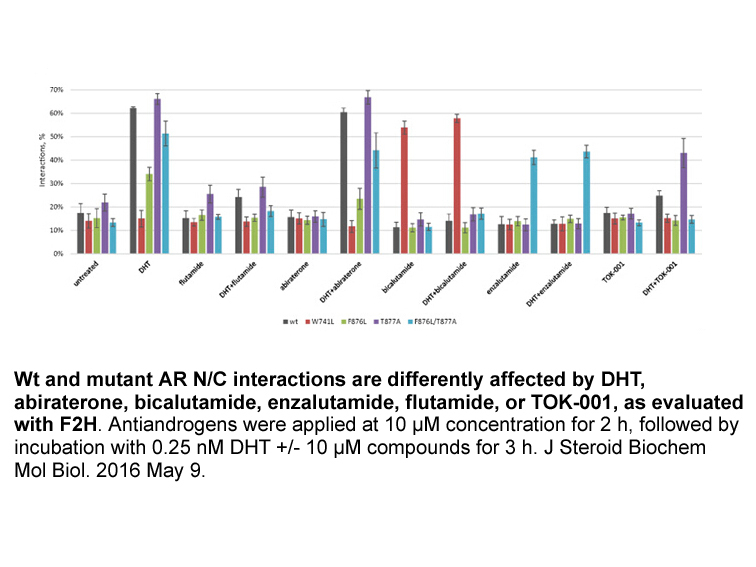 In HepG2 cells, bicalutamide could also significantly inhibit R1881-induced VP16-AR–mediated transcription with an IC50 value of 0.2 μM. In a clinically valid murine xenograft model of human CRPC, bicalutamide showed greater efficacy than MDV3100. Maximal therapeutic response in this model was achieved at 30 mg/kg/d of bicalutamide, whereas the same response required 100 mg/kg/d of MDV3100 and higher steady-state plasma concentrations. Bicalutamide is an active non-steroidal androgen receptor antagonist with IC50 value of 160 nM. The androgen receptor (AR) is a type of nuclear receptor. It is activated by binding of either of dihydrotestosterone or the androgenic hormones testosterone. Then, it will translocate into the nucleus as DNA-binding transcription factor which regulates gene expression. Androgen is critical for the maintenance and development of the male sexual phenotype through related gene. The androgen receptor (AR) is also related to the core mechanism of castration-resistant prostate cancer. Bicalutamide inhibits growth in prostate cancer cells (VCaP cells) which overexpress androgen receptor by directly binding to AR then mediates androgen-mediated gene transcription with IC50 value of 160 nM. Bicalutamide directly binds to androgen receptor with Ki value of 12.5μM. In prostate cancer cells, bicalutamide impairs DNA binding and nuclear localization. Bicalutamide and MDV3100 significantly inhibited R1881-induced VP16-AR–mediated transcription in HepG2 cells with an IC50 value of 0.2 μM. 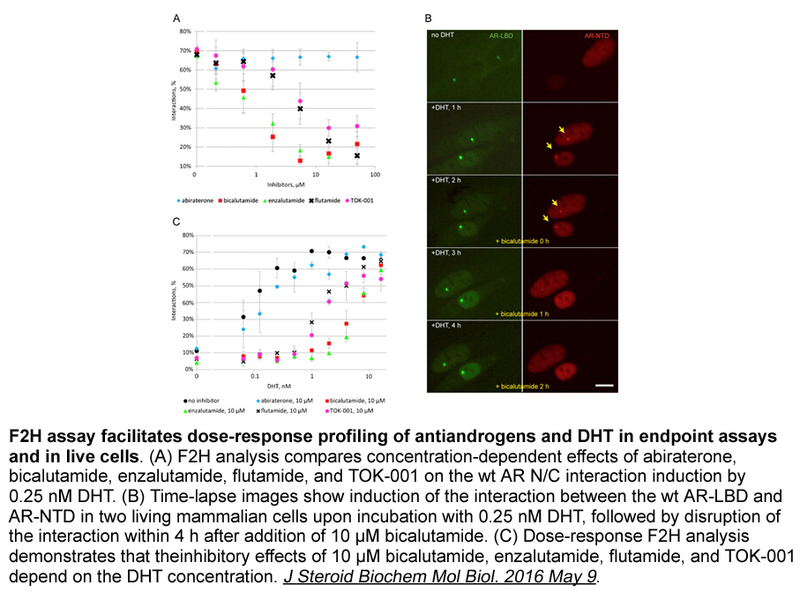 Bicalutamide has been an molecular template for designing selective androgen receptor antagonist used to the treatment of prostate cancer cells. Bicalutamide also induces cell death by a different pathway which is independent of mitochondrial membrane potential changes and Bcl-2 action. Bicalutamide significantly inhibited AR then decrease the tumor growth in murine xenograft models, male immunodeficient mice which harbors LNCaP/AR-luc xenograft tumors.
. Yin D, He Y, Perera MA, Hong SS, Marhefka C, Stourman N, Kirkovsky L, Miller DD, Dalton JT: Key structural features of nonsteroidal ligands for binding and activation of the androgen receptor. 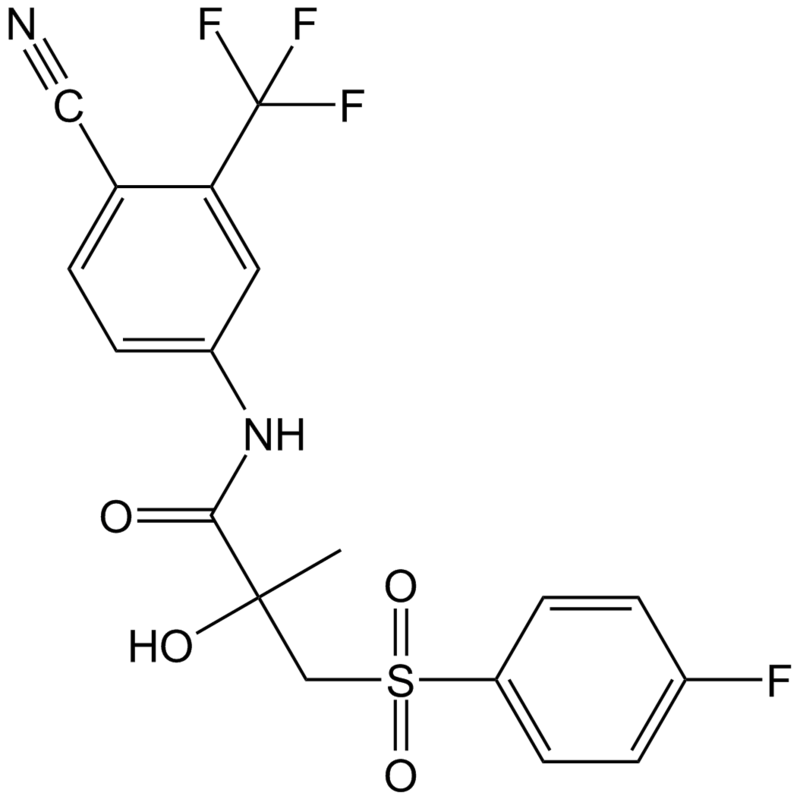 Mol Pharmacol 2003, 63(1):211-223.